The S&P 500 today lost 8.7%. That wasn’t the worst of it. The Nasdaq 100 lost about 10.5% and the banking index (BKX) lost 20%. For the S&P 500 there has only been 1 day that has been worse – 10/19/87 - the crash of ’87. On October 26, 1987 the S&P dropped 8.3%, which was close. Some other memorable drops since then would include 10/27/97 (-6.9%), 8/31/98 (-6.8%), and 9/17/01 (-4.9%). This was about 2% worse than any of those. 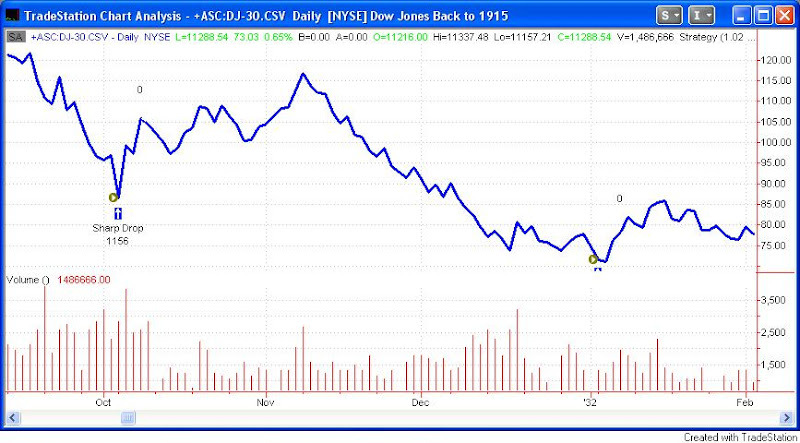 Using the Dow, I was able to look at similar drops back to 1920. Below are charts of all the times the Dow lost 8.0% or more in one day. 1932 and 1987 were the only instances that were near a low. In no case was a V-bottom like ’97, ’98, or ’01 formed. 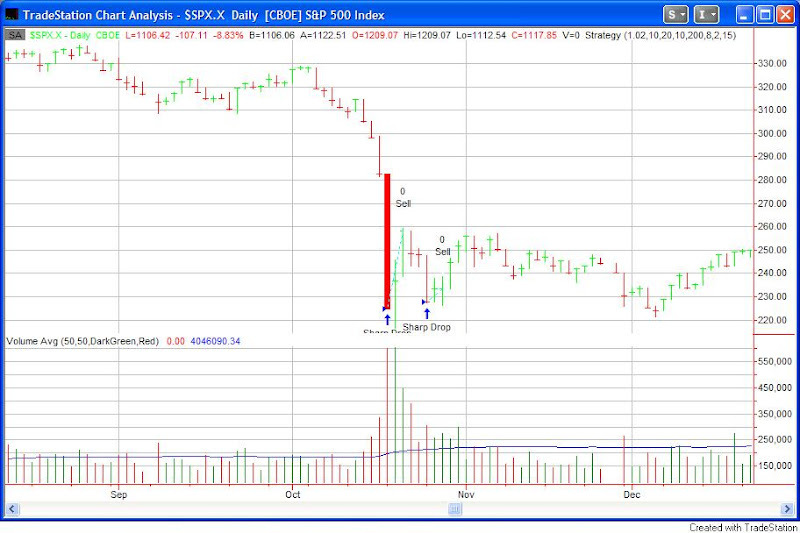 A sharp bounce was followed by either sideways or downward movement. 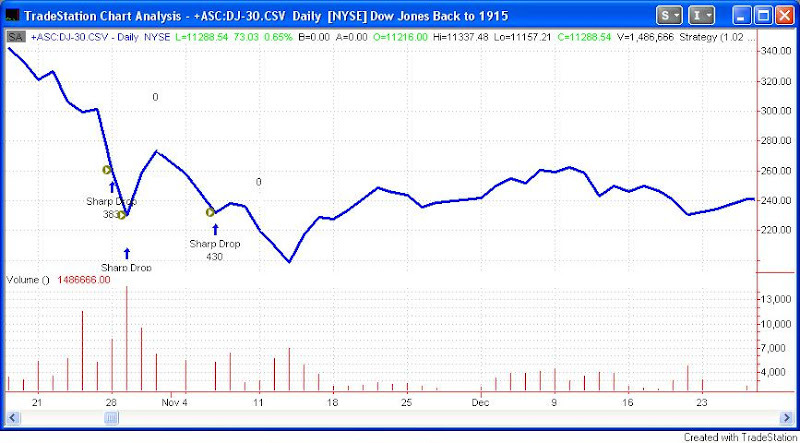 A sharp bounce occurred within 3 days in all cases. 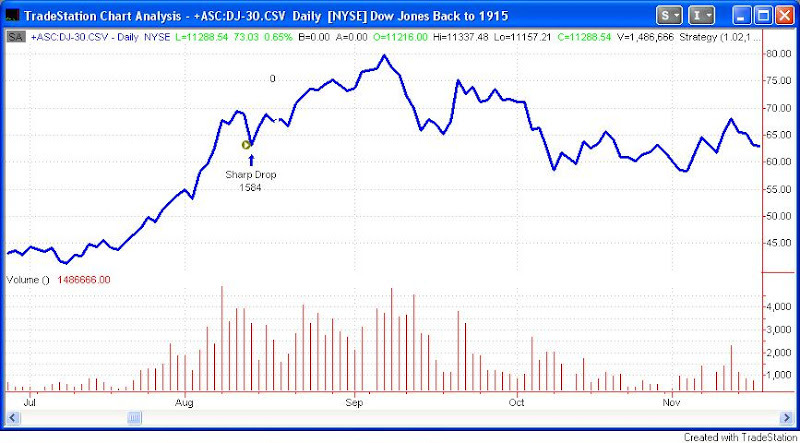 1932 was the only time the day of the big drop came after an extended decline. 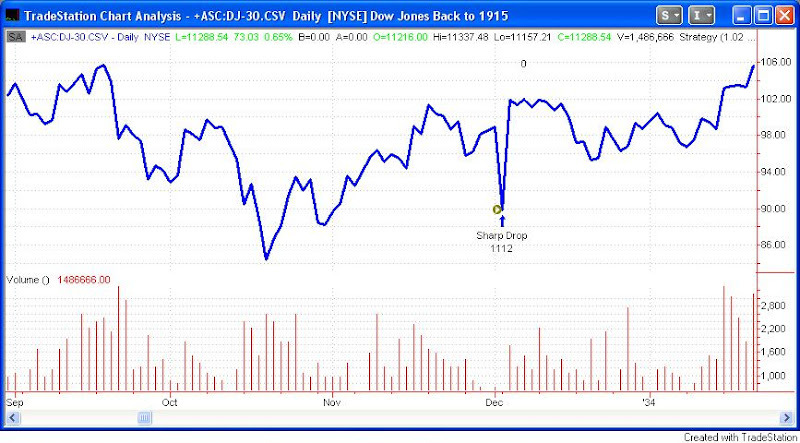 In contrast, the crashes of 1929 and 1987 happened as a breakdown from a topping pattern. They've outlawed short selling, now who do they blame? It's interesting that the politicians who helped create this mess have spent their careers taking credit for good things, even if they weren't involved, and, unlike successful traders, run from personal responsibility for their failures. They got us into it and now we're supposed to trust them to fix it??? Interesting that the CBI is only at 4, even after today's monster down move. Rob, what was the CBI the evening of 10/19/87? Thanks and keep up the good work! Yeah. It's scary when the only "solution" is to give the politicians more power and the bankers more money. You know, because they've both acted so responsibly with it in the past. Perhaps there should be an indicator that measures stress in Congress and another that measures how far they are willing to go to work together. When Congress is scared and they start working together, we're at the bottom. Hahahaah!! Rob, I've seen that one before, but thanks for reminding me. Since I don't want to read the whole study I don't know how much data mining or truth there is behind that study but it sure looks ugly!!! Does anyone know what days it is that congress is working then? PS. Rob, kevin asked you a question that would be interesting to know.